Each of us, in our everyday lives, compiles and maintains a variety of lists. Lists of phone numbers and addresses, assets and liabilities, bank accounts and credit card numbers, the list of lists we maintain is endless. Some lists are nothing more than sub-sets of other lists. For example, your list of securities purchased through a particular brokerage, is a sub-set of your current asset list. Other lists contain some items that are mutually exclusive and some that duplicated. Your personal address book and your list of emergency phone numbers would be good examples. Your doctor's name and phone number are most likely in both lists. Your next door neighbor might be on your personal list and not on the emergency list while the fire department is exactly the opposite. Our Lists reference the securities you want to follow, chart and analyze. They can contain up to 1000 symbols and can be a mixture of types (i.e. stocks, futures, options, indices, mutual funds, etc.). You can have up to 40 lists allowing you to follow 40,000 symbols if you choose. 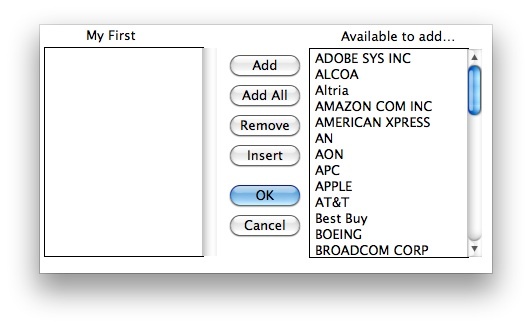 When you first downloaded the software it came with a single list titled "Main List" referencing your stated preference in security type. Initially most people choose to add and subtract from the Main List. We have additional lists of long term data available to download from our website. When you are ready to create a list the most important factor is choosing where you want it. If you want an empty list to which you will add new securities then we would suggest creating a new folder to store the list. It doesn't matter what you name the folder or the list or where you keep it on your Mac as long as it makes sense to you. If you are creating the list to be a subset or a superset of an existing list then you must create it in the same folder as one of your existing lists. Again, call it anything that you like as long as the name is unique. Begin by selecting "New List..." from the File menu. The application will present a dialog for you to name the list and decide where it will be created. In our example the dialog is set to create the list in the original data folder and is waiting for you to change the name from Untitled to something that makes sense to you. Note the New Folder button at the bottom of dialog which allows you to create a new place to store this list and the data it will reference. We decided to name this list My First and to save it in the original data folder. After saving the list, a small window, split in half horizontally will appear. On the left side of the window will be the securities in the list and the right side will display the symbols in the folder available to add to the list. Since this is a new list, the left side is empty. 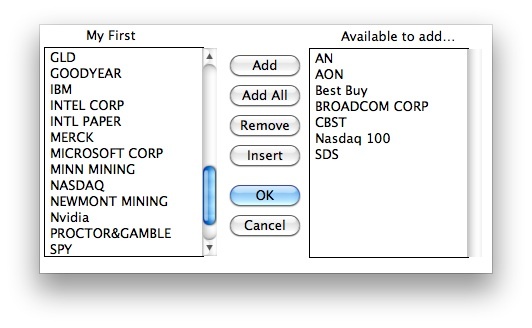 We want most of the securities in the folder to be in this list so we are going to press the Add All button then move some of the securities back out of the list. This is how the window looked just before we pressed OK at which point the window will disappear and the new list will open. Rearrange list order by dragging and dropping then select Save from the File menu.